This unit has a 6" Coupling welding capacity. These LIGHT machines can weld all sizes of Elofit Branch Saddles and Tapping Tees. This machine weighs 40 lbs which is over 30 lbs lighter than the large capacity model. Electrofusion Processor is manufactured in compliance with UNI 10566 standards and conforms to CE requirements. The unit has a barcode scanner compatible with standard ISO 13950 Barcodes. Data can be entered manually or automatically by scanning the barcoded fitting. During the welding cycle, the backlit display shows the heating time, power consumption and energy consumtion. The welding unit has the capacity to store information on 500 welding cycles and to communicate with a PC using the supplied memory card and data download software. 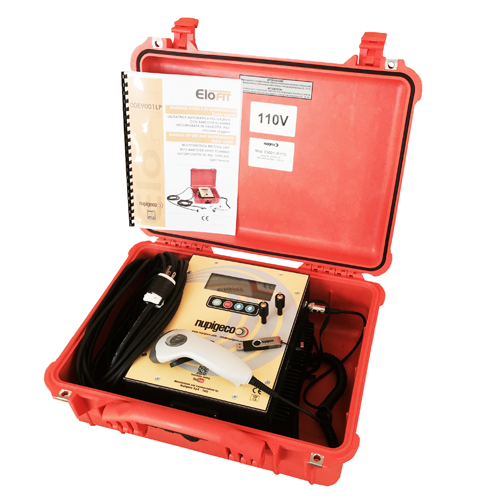 This machine can scan and fuse all major brands of electrofusion fittings that require heating input voltage up to 42 volts. • Connection Cables with 4mm connector pins and adapters for 4.7mm pins. • Lighted Display features 4 lines of information. WATCH A VIDEO OF THIS MACHINE IN ACTION! Click the button below to add the Elofit LIGHT Electrofusion Welding Machine w/Barcode Scanner and Heavy Duty Case 110v (6 INCH CAPACITY) to your wish list.